Watch Kyle Korver burn the Celtics multiple times on the same basic action, the Rockets confuse the weak side defense, and a clever twist on a common transition screen. Kyle Korver was on one of those runs. 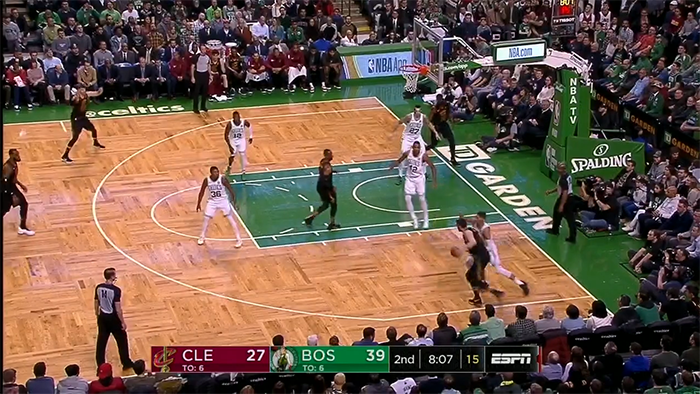 He had hit threes on the same exact action on back-to-back possessions, so when Kevin Love passed him the ball multiple steps behind the three point line, Terry Rozier took no chances and closed out hard to his body. “Good!” Brad Stevens shouted, as Korver, with no room to shoot, swung the ball to the top of the key. But Stevens had seen this movie before, and he knew there was still work to be done before the credits rolled on the possession. “Stay attached!” he screamed to Rozier as Korver slowly shuffled around a screen from Tristan Thompson. But Rozier made a fatal mistake: he released from Korver’s body to go around the screen. “Stay attached!” Stevens yelled again, his voice taking on a higher pitch, anticipating exactly what was about to happen. But it was too late. Thompson flipped the screen, Korver popped back out for the pass, and got a clean enough look to sink his third straight three. A wide pin down is a straightforward action. It’s just a pin down (a screen set facing the baseline, also known as a “down screen”) set wider on the court, closer to the corner. Compared to a more classic pin down set near the lane, it gives more space for the offense to operate and allows the shooter to curl to the three point line for a shot rather than to midrange. It’s not complicated. But Korver is a grizzled gunslinger: so crafty, accurate, and quick on the draw that all he needs is a simple screen to stick one right between the eyes. On the first of Korver’s threes in this sequence, Rozier made a similar mistake. He left Korver’s body and “shot the gap” on the screen, meaning instead of chasing Korver around the screen he ran through the space between the passer and the screen. Bang. 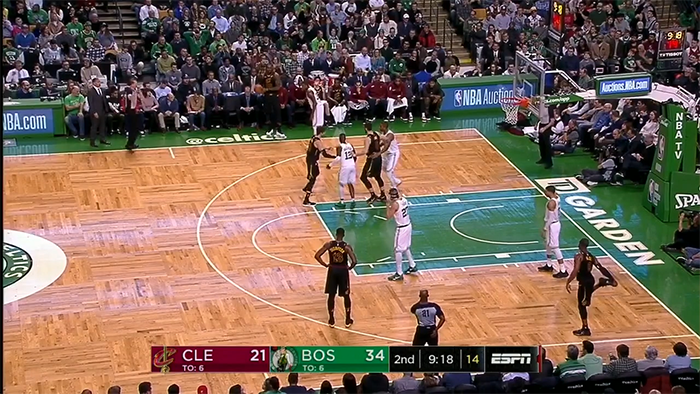 Of course, even locking and trailing Korver around the screen is no guarantee of success. 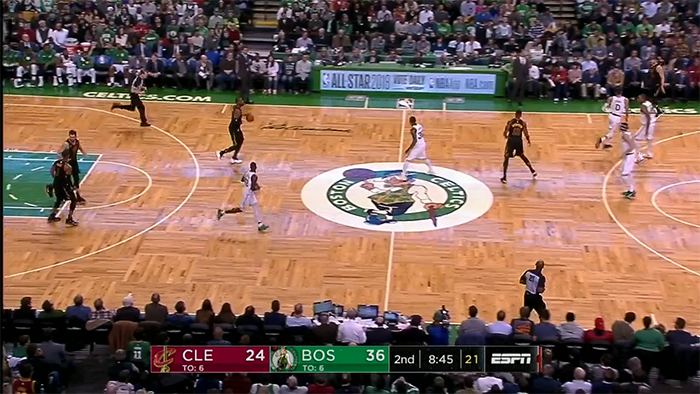 On the second of these three threes, Jayson Tatum stayed on Korver’s body, followed him over the screen, and got a long arm up right near the release point. But he was a split-second late, and Korver buried the shot. Bang. The Celtics tried a variety of tactics to slow Korver, with mixed results. But defending Korver is sometimes less about the approach and more about the precision in execution, because one false step is deadly. It’s no surprise that Korver, according to Synergy Sports, has been the most efficient player out of off ball screening action so far this season (minimum 50 off ball screen possessions). Lose concentration for a split second, and you’re staring down the barrel of a smoking gun.